Las Vegas, Nevada – October 18, 2017 (GLOBE NEWSWIRE) – Envoy Group Corp. (ENVV) (the “Company” or “Envoy”) is pleased to announce that its CEO, Lawrence Cummins spoke at the European Parliament on Blockchain Development in Brussels on November 7th, 2017. Recently Envoy, through its exclusive global agreement with Black Cactus Holdings LLC, solidified its commitment to become the Premier Blockchain and Digital Asset Financial and Media Technology company. Envoy is in the process of a name change to Black Cactus Global, Inc.
Black Cactus Global has developed powerful Blockchain based applications in media, industry and the financial sector and has the first fully functional digital to fiat currency Financial Trading Platform that allows the multibillion dollar cryptocurrency world full access to the global markets and vice-versa. Recently members of the IMF, World Bank, the UN and the European Parliament have all expressed great interest in Black Cactus Global’s effective and groundbreaking Blockchain designed platform. On an invitation from Mr. Antanas Guoga, a sitting Member of the European Parliament for Lithuania, Mr. Cummins addressed the members of 28 Nations today on Blockchain in Brussels, the de facto capital of the European Union. 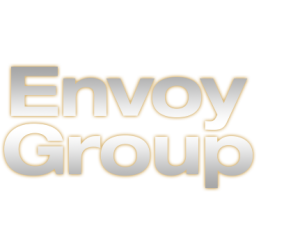 Envoy Group is a leading participant in many aspects of the Blockchain Technology space and is actively pursuing international expansion and global contacts with the goal of developing and offering meaningful strategies and services to the various sectors that will benefit from and be transformed by Blockchain technology.